Engaging in other activities and commitments can be difficult sometimes while being a working person. Think of learning a new subject while working, the difficulty intensifies. We all want to develop ourselves as a human being. Learning new things and earning a livelihood are two of the paramount of our lives. Making a crucial choice between these two aspects is complicated indeed. What will happen if you have to make a choice between Learning and Earning? That is where Online Learning comes to the rescue. A progressing approach for the working people which allows them to simply sign up to their virtual campus with the comfort of their own office or house. Albert Einstein always knew the future that is why his words reflect the fact that the need for effective education will remain constant forever. A rapid increase in the internet connectivity has led to the growth of E-Learning. According to a survey conducted in 2015, India has witnessed a growth rate of 55% in Online Learning. 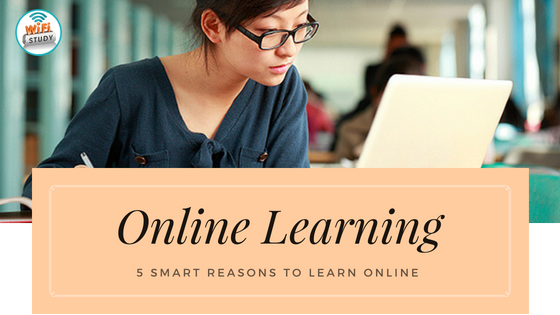 It is no wonder why a tremendous number of working persons across the globe are opting for Online Learning through the internet. E-Learning from WiFiStudy in the form of Online Test Series or Video lectures can be considered as the greatest revolution in the domain of contemporary education. Online education poses several opportunities to the working people who cannot grant their time to learn from the traditional methods and classrooms. You may find innumerable benefits of E-Learning on the internet but here are the top 5 reasons how Online Learning works well for working person. The feeling of learning something new and instantly applying it to your profession is simply majestic. Online Learning is comparatively more practical as it allows you to relate what you learn to your job. It makes the class more interesting by sharing relevant work related instances. E-Learning allows you to develop new skills and improve the existing ones. Skill development can instantly boost your earning potential and helps to meet the fluctuating needs of your profession. Furthermore, it also allows you to create new business contacts as you may find a number of people working in your niche. Online learning recognizes the importance of time in the life of a working people, thus, offers the facility of accessing the content 24/7. This facility allows them to schedule their study time according to their job. You, as a working professional, can complete your studies at your own pace and according to your timetable. Furthermore, you can also apply for several courses at once or one by one as per your comfort. The subjects might be different or related to each other. The fact that Online Learning is comparatively cheaper than the traditional mode of learning makes it more appealing to the working people. The affordability of the E-Learning is enough to convince many of the working people to choose it over the traditional education method. Most of the online courses you find on the internet are inexpensive and easily available. You can also easily save your travel time and expenses. Online Learning also adds to your comfort of studying as the content which you are looking for, is made available to you in a matter of clicks. There are many YouTube channels that let the candidates learn online for free. The YouTube channel from WiFiStudy is India’s fastest growing study channel endow students with quality education in 18 live classes on daily basis. Along with it, exam strategies, preparation tips, exam pattern and type of questions are slo included in it for the better preparation of exam. Earning a new degree or a diploma certificate boost your career opportunities. An online degree from a reputed university can enhance the chances of finding new and better career options. E-Learning helps to reinvent yourself if you are in a search of a job change. Apart from the above mentioned benefit, Online Learning also enhances your resume as it reflects your curiosity of learning new skills and your interest in different subjects. An online course certainly looks great on your resume which in turn makes you a suitable candidate for a job promotion. Self Paced is a term more related to E-Learning. Most of the online courses come with a label of Self Paced. 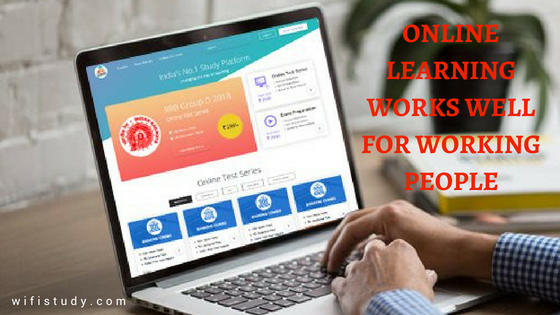 Self Paced Learning allows the working person to start finishing the course targets at any time and he or she can manage the studies and homework according to the individual’s time schedule. The system of Online Learning does not force the working people to attend the live sessions as the traditional mode of education. The material can be accessed by anyone at anytime on the internet, in a matter of clicks. These are the reasons which attract the people working in different companies to learn something new and develop new skills to enhance themselves as a professional. With the motivation and discipline of learning something new, E-Learning helps the working people to build their career and open new business opportunities. "Online Learning or E-Learning is certainly the more effective and convenient option of studying for a working person. Studying through multimedia content not only allows you to learn a subject efficiently but also it is safe for the environment as it saves a lot of paperwork. The Online Learning by WiFiStudy utilizes high-quality content including images, videos, and graphs for a better understanding. Lastly, the fact that online education is comparatively inexpensive compels most of the working people." E-Learning provides real value to working people as it is flexible and can help build the knowledge.